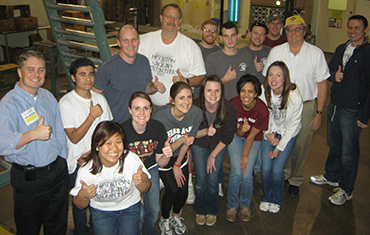 Work activities include sorting and cleaning donated food products, bagging bulk products such as rice and beans, filling distribution orders, producing standardized family boxes and similar tasks. 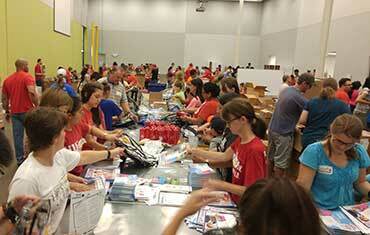 Please register with us at website calendar or call for more information. 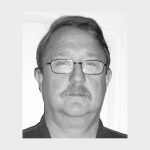 "We enjoy making a difference in our community and operate with a 'work hard, play hard' attitude." 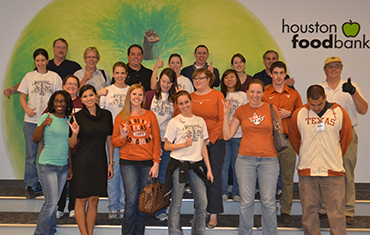 Join the Houston Aggie Volunteers on the first Tuesday of each month and/or one Saturday each quarter at the Houston Food Bank! Don’t forget this is an excellent opportunity to fulfill the volunteer community service hours for high school, college, and other community service organizations. 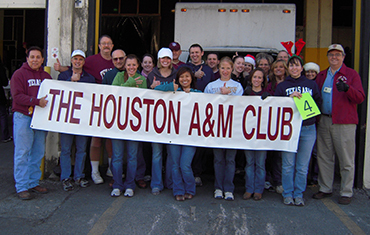 For more than 17 years, the Houston Aggie Volunteers have helped the Houston Food Bank feed at least 137,000 people each week (a population exceeding that of all of Bryan/College Station), providing more than 65 million pounds of food and prepared meals annually.